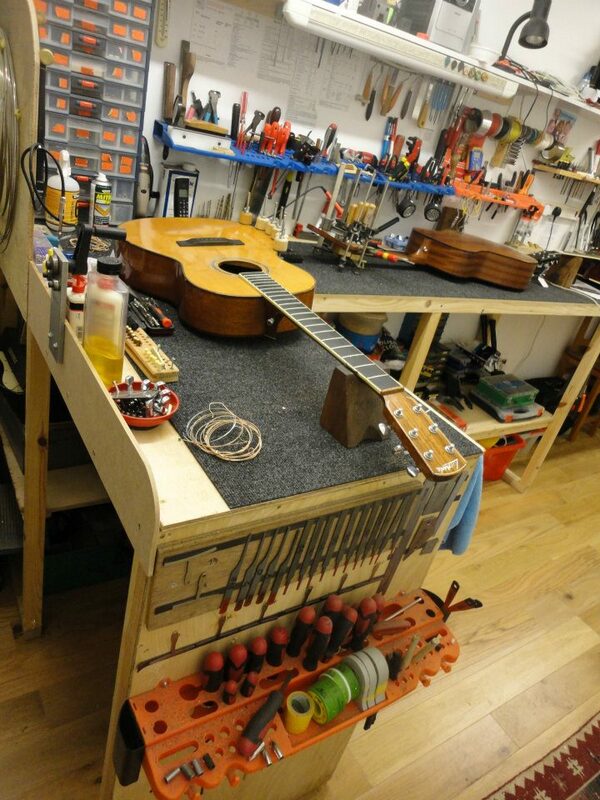 I have been carrying out professional repairs and restorations to fretted instruments for almost 3 decades. In this time, I have worked on literally thousands of instruments. Older instruments, say a Martin D-18 or a Gibson J-45 et al that have suffered from years of use, abuse, bad luck and age related issues can be brought back from the brink to tip top playing condition. I LOVE breathing new life into instruments, especially vintage stock. For a list of popular repairs, modifications, re-furbs etc look at my Price List. (Price On Application; After a thorough examination, assessment and diagnosis along with a quote). You may want to ask me for a QUOTE wherever you are in the United Kingdom. I receive a lot of instruments for restoration, neck re-sets, structural repairs and fret work from all over, including Ireland and France. If you are thinking of using my professional services, please phone to discuss before using your own courier to transport it to my workshop; +44(0)1736 332584 / +44(0)7812 178469. You are responsible for packing correctly, and for all ‘to and fro’ shipping costs. I will not be liable for damage caused whilst in transit. You agree to this if you send an instrument to me! Phone to have a chat first. State the make, model, serial number (if appropriate) and colour of the instrument. List nature of faults/menu of work you require. Include your contact details; home address, email, home, work & mobile phone numbers. I will usually give a ‘ballpark’ figure for work before I physically have it in my hands, so I will contact you with a quote and mention any other requirements before any work commences. Work commences once we have both agreed the menu of work and the price agreed. Turnaround depends on the type of job, but expect between 2 and 6 weeks for completion. Sending any guitar through the post or by courier need not be a problem if you pack it properly! Handlers are less than careful and are throwing our prized guitars in and out of vans like they are stacking logs of firewood! First of all, get hold of a sheet of bubble wrap or other suitable packing material – visit your local guitar shop as they are always taking delivery of guitar boxes stuffed with it, they are usually only too happy to let you take them away for nothing. First slacken off the strings slightly to relieve a bit of the tension. Next, remove the switch tip of the 3-Way or 5-Way switch and tape it to the pickguard or in a sealable bag. Slip a sheet of paper or cardboard between the strings and the frets – strings can damage frets and pickups if they are knocked against them in transit. Obviously you will need to remove the tremolo arm if there is one. 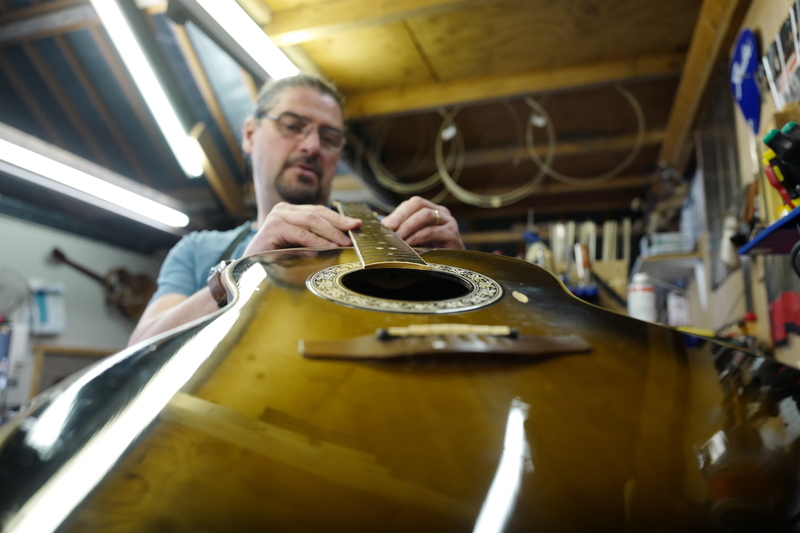 Wrap bubble wrap carefully around the headstock and the rest of the guitar taking particular care with any exposed or pointed parts. Add as much packing as possible before sealing the box with strong tape. ‘Sender: F Bloggs, 12, Nowhere Street, G62 9HR’ to help the courier deliver it back to you in case of delivery problems. Please be aware that guitar necks have been known to break inside the case, so pack the guitar properly inside the case (as above) before sending. Stuff enough newspaper in the bottom of the box so it acts as a cushion for the bottom of the case to sit on. Add a layer of bubble wrap or strong paper around the case to avoid scuffs and to stop it from rattling inside the box. I ADVISE YOU TO INSURE YOUR INSTRUMENT ! PLEASE BE AWARE YOU ARE RESPONSIBLE FOR ALL SHIPPING COSTS ! I WILL NOT BE LIABLE FOR DAMAGE SUSTAINED ON EITHER JOURNEY WHEN THE INSTRUMENT IS NOT IN MY CARE.